LUCKY LAKE CAMPGROUND's VIP CAMPING PROGRAM DURING THE ELECTRIC FOREST FESTIVAL. Come and camp at Lucky Lake Campground during your stay for the Double JJ Resort's Electric Forest Festivals. 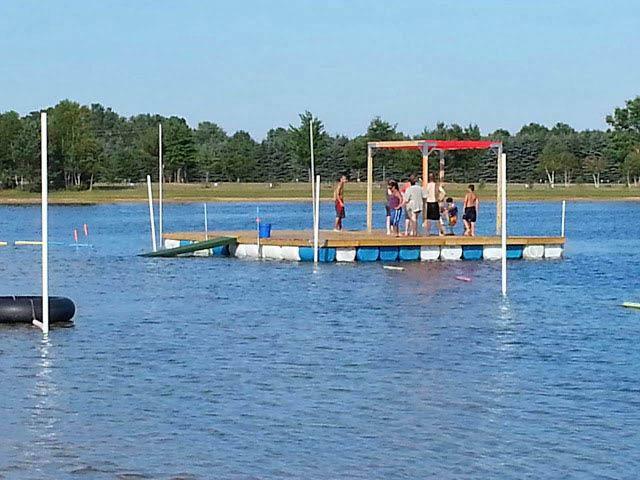 Enjoy our private 40 acre soft water lake with sandy beaches, huge sand bar in the middle of the lake with water volley ball, swim docks, trophy fishing (no Lisc. required/catch & release only). Our 180 acre property is adjacent to and just South of the main entrance to GM camping. Our main entrance is just 1/4 mile East from US-31 right on Winston Rd. (Exit Ramp #136), very easy to get to and come/go without encountering the festival entrance's traffic. 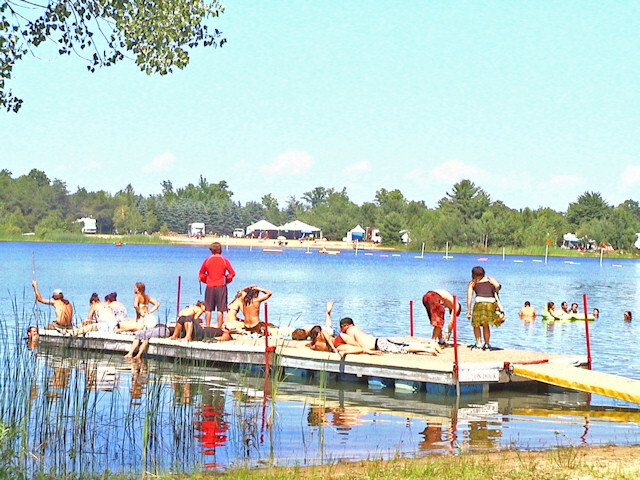 Lucky Lake's VIP packages -- both cover 8 days and 7 nights, your choice of camping facilities and sites from our many 250 lakeside, open and sunny, or shady and tree covered, plus big group sites, private secluded sites--- all your choice for your stay. 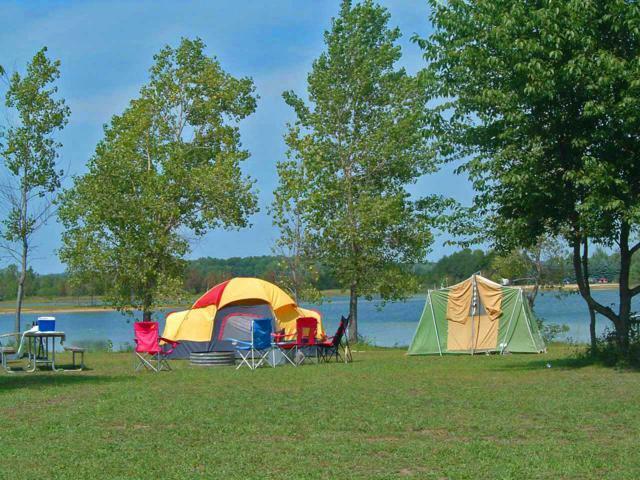 We have dozens of great sites for tents and hammocks, grassy & shady, both on the lake and off. We have Rustic, Electric, and Water & Electric sites (both 20/30 Amp and 20/30/50 Amp) for your camping style. All of our sites are plenty large enough for a 45 foot RV, tent and all of your friends, ask anyone that has been here! Book now, come and enjoy a pristine clean lake for the greatest concert experience of your life. EZ come and go like adults. See why so many of our guests come back every year! TOTAL PRICE INCLUDES: The entire 8 days & 7 nights (that's 7nights or 1 night, same price), shuttle to and from festival grounds from 4 PM to 4 AM, Fri., Sat. and Sunday nights, all the 180 acres to enjoy, EZ come and go with our wristbands and car pass. RUSTIC sites are $140 per person (no minimum), ELECTRIC sites are $170 per person (4 person minimum) and WATER & ELECTRIC sites are $190 per person (4 person minimum). Utility sites all have a minimum due to the limited supply, no limit on Rustic or group sites. Call for pricing for groups of 20 or more. Bring your friends and everyone saves! Credit card required for reservations. Charges to be posted after May 1. Those that wish to pay by check can do so but check MUST clear by May 15. For reservations please call (231) 894-3500. 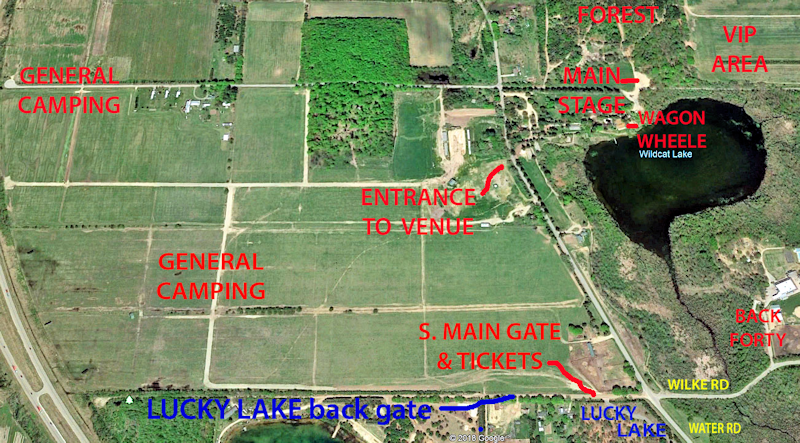 Lucky Lake Campground & Outdoor Center LLC is an independently operated facility located on property adjacent to the Electric Forest Festival (located at the Double JJ Resort) and is not affiliated with, sponsored by or endorsed by the operators of the Electric Forest festival. You must obtain tickets from EFF to enter the festival event property. Catch & Release only, no license required. 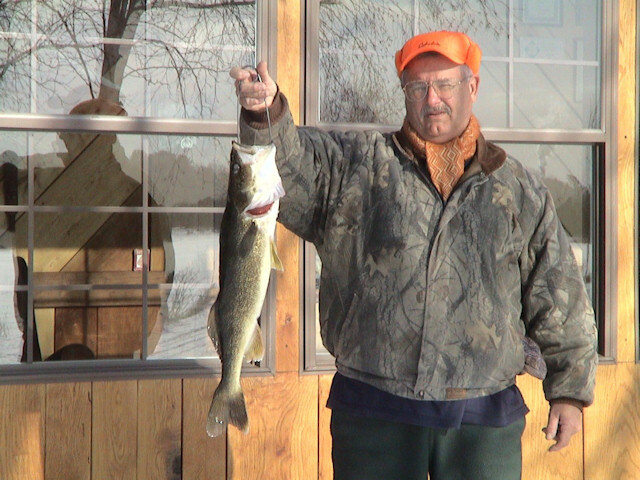 Northern Pike caught to 42", Large Mouth Bass to 24", Walleye to 27", White Crappie to 18", Bluegills over 10", Yellow Perch over 17"+ Rock Bass, Small Mouth Bass, who knows? Sorry, we had one 3 foot+ Dog Fish (and only one) but he died trying to swallow a snapping turtle! 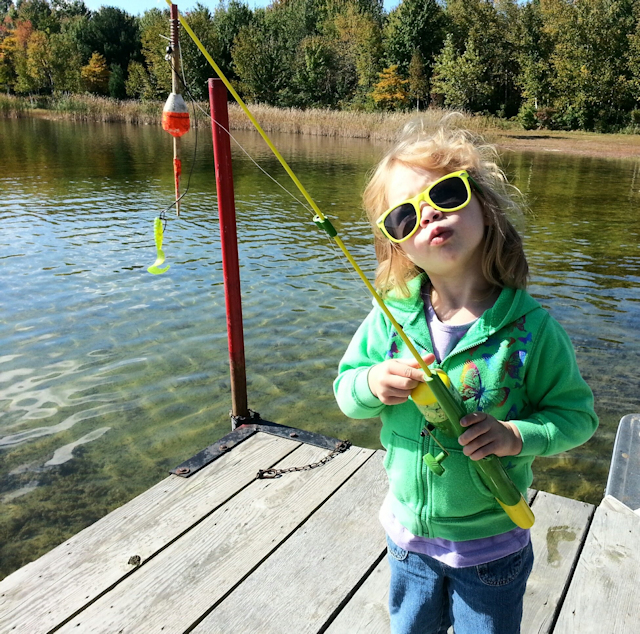 Here's your chance to have a great time fishing, don't foget the kids and get free camping days! If your camping or just in for a day of swimming and picnicking, grab your favorite fishing pole, a tape measurer and your camera. When you catch that "biggest fish of my life" (last year I had several people with that exact quote) then gently remove the hook, measure it from nose to tail, get a good picture showing you with your prize catch and return it back to the water to get even bigger next year. Ask for a "Fishing Contest" form, fill it out and leave it at the office before leaving the park, then when you get your picture printed, send us a copy and we'll post it on the Bragging Board. 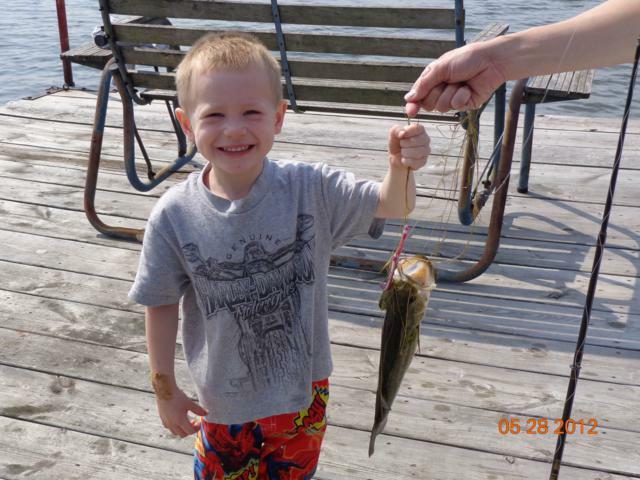 Winners of each category (Northern Pike, Large Mouth Bass, Small Mouth Bass, Walleye, Crappie/Speckled Bass and Bluegill/Sunfish) will receive their choice of a free weekend (Friday-Sunday) or week long (Sunday-Friday) rustic camping trip. No license required, you may bring your own boat (please, no gas motors), catch and release only. Any questions? Just ask. 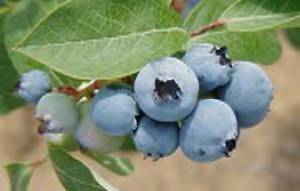 During the months of August & Sept. campers can walk around the lake and pick blueberries to munch on or a few for those breakfast pancakes. Pesticide free and delicious, great from the bush. For those that want to take a few home, there are many fruit stands nearby plus the very unique town of Montague, just South of here, has a farmers market, google for times.